9 Inspirational Quotes By Sam Pitroda The Man Who Revolutionised Indian Telecom Sector That Will Get You Going. Many of us have memories of using payphones to call our beloved when mobiles were not a rage in the country. The man who was responsible for this makeover of Indian telecom sector is Sam Pitroda. His real name is Satyanarayan Gangaram Pitroda and the story of how he got the name Sam is interesting. Pitroda recalls, "I was working in the US, and people there decided to call me Sam. I got a pay cheque which said Sam Pitroda. So, I had an option - I keep my original name or the money. Money was important so I kept it and let go the name." There is also a funny incident which implored Sam to change the way telecom worked in the nation. Here's a narration by Pitroda himself about how things took shape. "Once I was in India and staying in a hotel. Interestingly, I saw a few people taking out a funeral of 'dead phones', I was intrigued that phones don't work in India. I tried to call my wife back in Chicago but the phone didn't work. I told myself, with a little bit of ignorance and lot of arrogance, that I will fix this. If I would have known about India that I know today, I wouldn't have tried it. Ignorance is a great asset," says Pitroda. Here are some of the best inspirational quotes by the famous scientist Sam Pitroda. 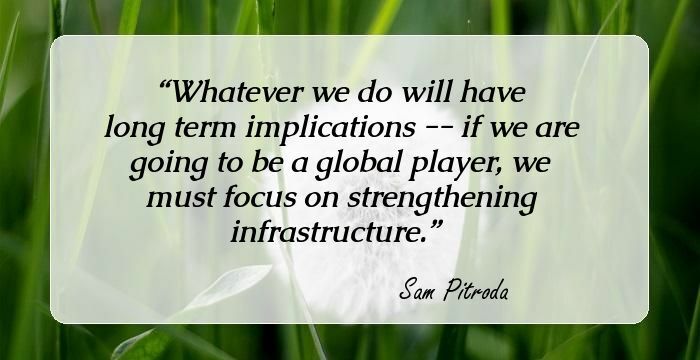 Whatever we do will have long term implications -- if we are going to be a global player, we must focus on strengthening infrastructure. 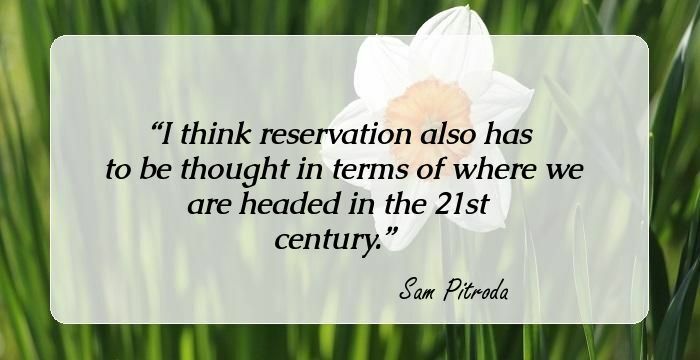 I think reservation also has to be thought in terms of where we are headed in the 21st century. The decision on extending reservation in Central universities should be taken only after a larger debate. It is time we structure our institutions of knowledge to be a global player in the 21st century. We need to increase that number to 25 percent. This is a unique opportunity to leave behind the British legacy to invent a new India using knowledge. The priority should be to improve the quality of teaching, introduce new tools and technology and enhance the course-wise credit. I can say confidently that there is not an area of nation-building where some overseas Indian somewhere does not have expertise in. I believe that intellectual property will take on a different meaning. 14 Inspirational Quotes By Vikram Sarabhai, The Father Of Indian Space Programme, Who Orchestrated The First Satellite Launch In The Country. 9 Inspirational Quotes By Nobel-Laureate C V Raman That Will Fill You Up With A New-Found Zeal. 27 Impelling Quotes By A P J Abdul Kalam, The Missile Man Of India Who Revolutionized Space Science In The Country. 20 Motivational Quotes By Venkataraman Ramakrishnan That Reveal The Importance Of Harboring A Scientific Temperament In Life.